Ireland was the first Home Union to award Test status for internationals against Italy. The nations have met 16 times since 1988 in major Tests. Ireland heads the series by thirteen wins (including the last dozen matches) to three. Italy's wins were between 1995 and 1997 in successive friendly internationals outside the Six Nations Championship. Ireland holds the record for the most tries, highest score and biggest winning margin of the series. They scored eight tries in the 61-6 win at Thomond Park, Limerick when the sides met in 2003 in a World Cup warm-up match. 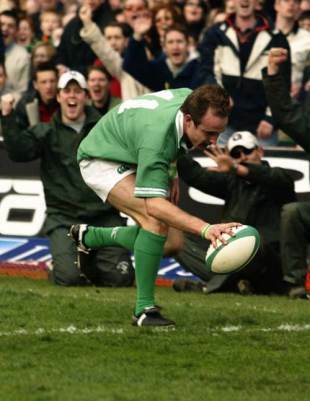 Ireland also scored eight tries in the 2007 Six Nations match in Rome. The other overall records include Ronan O'Gara's tally of 134 points from nine appearances (compared with 96 for Italy by Diego Dominguez), and Alessandro Troncon's dozen appearances in the series. Four Irishmen have played in ten of the matches: Girvan Dempsey, John Hayes, Malcolm O'Kelly and Peter Stringer. John Hayes lies one cap behind Malcolm O'Kelly's on the all-time list of Irish Test appearances (91).